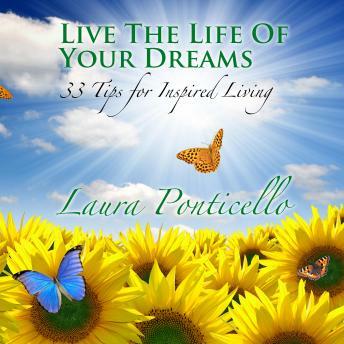 In Live the Life of Your Dreams: 33 Tips to Inspire Your Life, awardwinning author and inspirational speaker Laura Ponticello has interviewed women from all over the country to uncover firsthand what inspires them in their daily lives and how they tap in to this inspiration. In doing so she discovered that women feel most inspired when they are empowered. Live the Life of Your Dreams: 33 Tips to Inspire Your Life is a collection of healing graces, healthy practices, and inspirational words to help listeners on their paths to empowerment as they explore achieving personal fulfillment. Real women have provided their personal stories of triumph, soughtafter purpose, and acquired wisdom in this audiobook. The book can be listened to at any minute, and a nugget of inspiration can be found.